Heatline Capriz2 24 kW Combination Boiler ErP | Buy a New Boiler Now! With Vaillant’s full after sales care service! 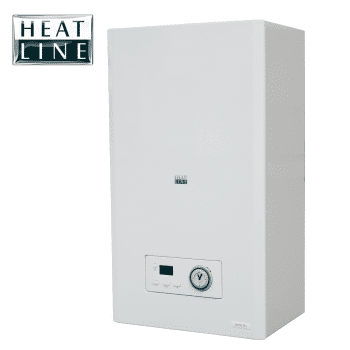 The Heatline Capriz2 high efficiency condensing combination boiler is available in 24kW and 28kW outputsand comes fitted with a 24 hour easy-to-use analogue timer. The Heatline Capriz2 is an ErP A rated boiler and achieves a SEDBUK 2009 efficiency rating of 89.3%.Our lightweight easy-to-install boiler is an excellent choice for those requiring a no-nonsense, value for money combi solution and is supported with a 2 year manufacturer parts and labour warranty for further peace of mind. Heatline is a trustworthy UK manufacturer of affordable, high quality domestic central heating solutions including high-efficiency condensing boilers and more, available from ZEROhomebills.com heating and cooling supplies. Heatline’s 50 years of manufacturing experience has attained a solid reputation amongst installers who opt for Heatline products for their ease of use and comprehensive installation procedures. Heatline is part of Vaillant Group and all CaprizPlus boilers come with Vaillant’s full after sales care service. Heatline is a trademark of the Vaillant Group. VISIT Manufacturer` Webpage here. Join our ZERO Home Bills Community. Buy a gas boiler from the best gas boiler manufacturers at best retail prices available in your market on ZEROhomebills.com by Solaranna. Hot Water Solar Systems? Buy one here. Heatline is a trustworthy UK manufacturer of affordable, high quality domestic central heating solutions including high-efficiency condensing boilers and more, available from ZEROhomebills.com heating and cooling supplies. Heatline’s 50 years of manufacturing experience has attained a solid reputation amongst installers who opt for Heatline products for their ease of use and comprehensive installation procedures. Heatline is part of Vaillant Group and all CaprizPlus boilers come with Vaillant’s full after sales care service. Heatline is a trademark of the Vaillant Group. VISIT Manufacturer` Webpage here. Join our ZERO Home Bills Community. BEST Products from the BEST Brands at the BEST Prices available in your market on ZEROhomebills.com by Solaranna.